"We would be honoured to have you", he writes at the end. Former White House chief strategist Steve Bannon was hastily disinvited from the annual New Yorker festival on Monday, after his inclusion as headliner sparked online outrage and the decision to drop out by many other speakers. Later, the magazine dropped Bannon from the festival lineup. The New Yorker has disinvited Steve Bannon from the magazine's upcoming annual festival, after several high-profile celebrities balked at the idea of appearing alongside the man credited with numerous divisive strategies that propelled Donald Trump's presidential campaign. "I have every intention of asking him hard questions and engaging in a serious and even combative conversation", Remnick said. Apatow said he would not take part in an event that "normalizes hate" and suggested the New Yorker read its own reporting on Bannon. "The audience itself, by its presence, puts a certain pressure on a conversation that an interview alone doesn't do". This is PT Barnum level horse****. And it was announced on a weekend just before tix went on sale'. "I apologize to Susan Morrison as I was really looking forward to our conversation". "I'm out. Sorry, NewYorker. But hard pass on this amateur-night sonofab--h". "See if Milo Yiannopoulos is free?" Musician Jack Antonoff said he hadn't been told about Bannon's invitation when he accepted his own. 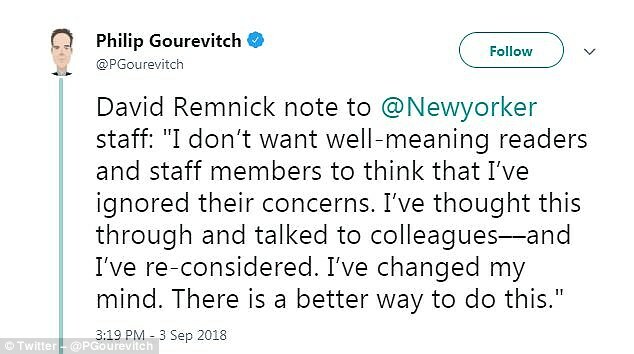 And when New Yorker staff writer Alexandra Schwartz tweeted, "I am hugely relieved that the event will not happen", economist and author Malcolm Gladwell replied, "Call me old-fashioned". "But Bannon has already exerted enormous impact on Trump; his rhetoric, ideas, and tactics are evident in much of what this President does and says and intends", he added. "Bannon? And me? On the same program?" - Chelsea Clinton (@ChelseaClinton) September 3, 2018Hey, New Yorker, I'm happy to come see Steve Bannon speak at your festival if Robert Muller is asking the questions. British writer Laurie Penny tweeted Monday that she "cannot in good conscience appear at an event which chooses to dignify a neo-nationalist like Steve Bannon". Faced with all these A-list departures, festival organizers quickly chose to do an about-face, announcing that Bannon would no longer be invited to speak. "I've thought this through and talked to colleagues - and I've re-considered", said Remnick. He then said concern from others about the setting of the interview, which he was due to conduct on-stage, had made him change his mind. There is a better way to do this. "There's no illusion here". As many have no qualms about calling Bannon a white supremacist, the sentiment was readily expressed that there was no reason to give him a panel and let him have a platform to espouse his views.